Stay up to date with the latest medical news and research at UHealth. Family medicine practitioner, Harold Johnson, M.D. ’94, does not generally attend school reunions, but when it came time to celebrate the 25th anniversary of his medical school graduation with his classmates, Dr. Johnson knew he did not want to miss it. Hall of Fame honoree Stephen B. Liggett, M.D. ’82. 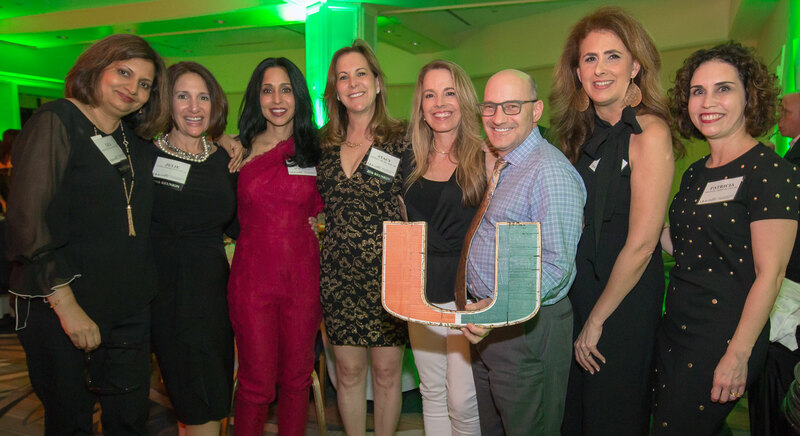 Dr. Johnson’s classmates from the Class of 1994 were among the more than 100 University of Miami medical alumni from around the country who came to Miami March 1-2 for a weekend of reunions, celebrations, and seminars — all part of the Miller School of Medicine’s Medical Alumni Weekend 2019. One of the weekend’s main events was the Reunions Banquet at the InterContinental Miami Hotel, which went late into the night with food and dance. It was a celebration not just of the Class of 1994, but also the 50th anniversary of the Class of 1969. Other alumni celebrating milestones included the Classes of 1959, 1964, 1974, 1979, 1984, 1989, 1999, 2004, and 2009. Medical Alumni Weekend kicked off with one of the school’s most enduring traditions — the 19th annual John G. Clarkson Freshman Pinning Ceremony. Following a keynote address from Joel Salinas, M.D. ’11, MBA ’11, MSc, assistant professor of neurology at Harvard Medical School, the Class of 2022 was symbolically pinned by alumni and academic society leaders, officially welcoming them into the ranks of the UM family of physicians. Medical Alumni Weekend also included tours of the medical campus and continuing medical education courses, featuring members of the UM faculty. In addition, it was a chance to celebrate the school’s successes. 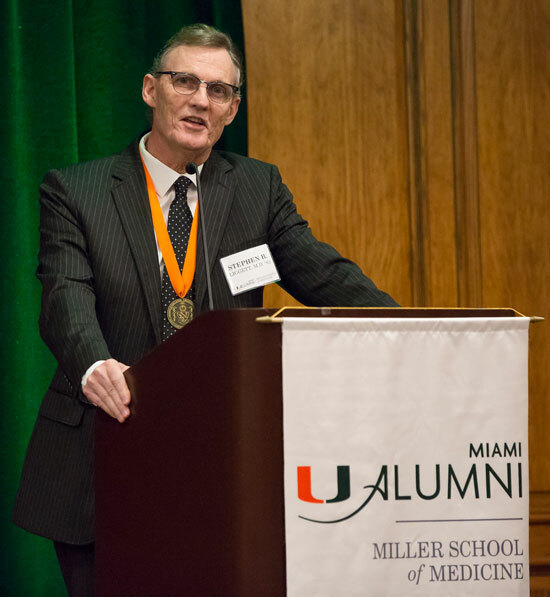 The UM Medical Alumni Association held the Hall of Fame induction ceremony — an award given to alumni at least 10 years post-graduation who have achieved national or international recognition for an outstanding contribution in academic, research or societal aspects of medicine. This year’s honoree was Stephen B. Liggett, M.D. ’82, professor of internal medicine and molecular pharmacology and physiology, vice dean for research at the University of South Florida Morsani College of Medicine, and associate vice president for research at USF Health. Dr. Liggett was lauded for his tremendous impact on the medical field: 18 grants from the National Institutes of Health, 23 issued or pending patents, 250 publications, which have been cited more than 27,000 times, and his reputation as a renowned author and worldwide lecturer. He was introduced by Alberto A. Mitrani M.D. ’84, the chair of the Alumni Awards Selection Committee, who spoke about Liggett’s study of adrenergic receptors and the clinical impact it has had worldwide. Alumni from the Class of 1994 celebrate at the Reunions Banquet. Dr. Liggett received a BS in physics from the Georgia Institute of Technology and attended the Miller School from 1978-1982. During his fourth year of medical school, he worked in the laboratory of one of his early mentors, Lincoln Potter, Ph.D. It was there that Dr. Liggett began focusing on receptor biology, which became his life-long research interest. His research then took him to Duke University as a fellow at the Howard Hughes Medical Institute in the laboratory of Robert J. Lefkowitz, M.D., who won the 2012 Nobel Prize in Chemistry. Dr. Liggett studies the molecular biology and pharmacology of G-protein coupled receptors, the largest superfamily of proteins in the body. He reflected on the difference that a professor can make in a student’s life. In 1990, Dr. Liggett became an assistant professor in the Departments of Medicine and Pharmacology at Duke, and subsequently became the Taylor Endowed Chair of Medicine and director of the Pulmonary and Critical Care Division at the University of Cincinnati College of Medicine. To see photos from Medical Alumni Weekend, click here. For more information on alumni events and news, visit http://www.alumni.med.miami.edu/.